It's time to change the conversation about Kevin Durant. While KD only has himself to blame for the drama he's created off the court, you can't can't criticize him for what he's doing on it—especially in the playoffs. HOUSTON — On this, everyone should be able to agree: Kevin Durant is responsible for the ongoing conversation about Kevin Durant. Durant chose to leave Oklahoma City for a 73-win team. His decision ended a budding Thunder-Warriors rivalry before it really got started. He registered those burner accounts, liked all those tweets, and took those unnecessary shots at his former team. He joined a Warriors organization where he would never be as beloved as Stephen Curry and Draymond Green. He publicly ceded leadership duties to Curry. He taped those podcasts, bemoaned those “Blog Boys” and pushed back against analytics, even as his own game and team represent high-efficiency, high-IQ basketball. And he has avoided making waves at the podium, mumbling through clichés instead of launching into LeBron James-like soliloquies while wearing Nike sweats instead of tailored suits. On this, though, everyone should also begin to acknowledge: Durant has been the best player in the 2018 NBA playoffs besides James. For the second straight year, he’s raised his level of play in the postseason, looking unfazed and unguardable in high-pressure situations and hostile environments. He’s been more consistent than James Harden, he’s carried a heavier offensive load than Al Horford, and he’s still playing, unlike Anthony Davis. Durant poured in 37 points in a 119-106 win over the Rockets in Game 1 of the West finals Monday, prevailing in a duel against Harden, the 2018 MVP favorite. He quieted a boisterous Toyota Center crowd with pretty turnarounds and step-back threes, helping Golden State endure a strong Houston start, early foul trouble for Draymond Green, and an off night from Stephen Curry, who looked limited physically after a recent return from his knee injury. Make no mistake, Game 1 was losable for the Warriors. Harden came out red–hot and focused. Chris Paul was as feisty ever. The crowd was louder and far more optimistic than it was during the 2015 finals. Green admitted that he came out “overzealous” and received a technical foul less than two minutes into the game. Curry never looked perfectly healthy, and he had to work overtime defensively as the Rockets targeted him. 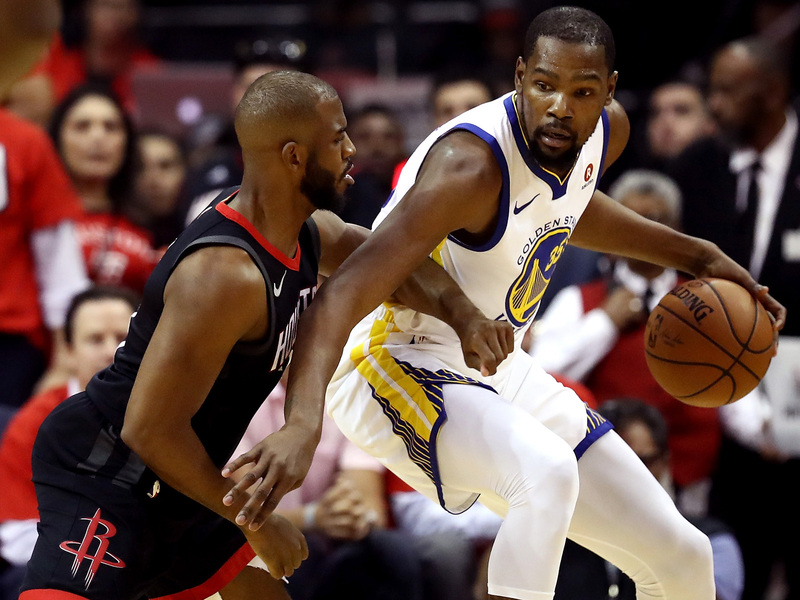 Golden State prevailed because it kept its collective composure after Houston’s opening flurry, because Houston’s supporting cast came up small, and because Durant punished his defenders time and again. The Rockets loaded up their roster with perimeter stoppers last summer and none stood a chance. In this, Durant has become the anti-James. When Cleveland wins, James gets the credit. When Cleveland loses, James’s teammates usually take the blame. However, when Golden State wins, Durant’s teammates usually get the credit. And if Golden State ever loses big in the playoffs, Durant would surely be first in line for the blame, punchlines and memes mocking his next free-agency decision, and all the rest. It would be a shame for this dynamic to continue indefinitely. Durant can’t take back his decision, he can’t go back in time to do a better job hyping the move, and he really shouldn’t apologize any more for his silly social media behavior. (The fifth time was sufficient.) Despite the baggage, he is still a 29-year-old MVP—a possible top-five all-time scorer and a certain first-ballot Hall of Famer—at the height of his powers, cutting through the noise to make one of the league’s best defenses look hopeless. He’s now averaging 28.8 PPG, 7.5 RPG and 4.6 APG without really forcing the issue, aside from loudly expressing his frustration at Kerr when he was taken out of the game in the third quarter. Although it’s sacrilegious to say, Durant has been so consistently excellent in the postseason that Golden State might not need Curry to win the title. This sentiment, if conveyed at all, has come via whisper. The opposite take—that Curry’s Warriors don’t need Durant—is invariably shouted. Yes, Curry was there first, and the foundation for this potential dynasty was made in his image. But downplaying Durant’s central role in Golden State’s 25–3 postseason record over the past two years would be inaccurate and disrespectful. To careful observers, he’s erased every question about his value and answered every doubt about his game since arriving in Golden State. He’s climbing to new heights, and he knows it. Last season, Durant went home with his first ring, his first Finals MVP and little in the way of closure. If the Warriors keep rolling like they are now, he could end this season in the exact same fashion. Would a second ring and a second Finals MVP be enough to forgive his original sin of joining the Warriors? For many people, probably not. If forgiveness is still a bridge too far, start with unqualified appreciation. Durant has taken a year’s worth of lumps with no end in sight. For now, try savoring Durant as he gets to his spot, raises up above the contesting hands, splashes shot after shot, and leaves another coach searching for solutions that aren’t there. There will be plenty of time to bemoan the NBA’s lack of competitive balance and ponder the endless what–ifs of Durant’s 2017 decision during the offseason. Over the next month, the conversation around Durant should be simple: the man deserves his due.